If you’re accustomed to hanging out with middle-class people who send their kids to pre-school and buy them Harvard sweatshirts when they’re five, you and your kids are missing a view of an urban subculture of teenagers who are likely having more fun skateboarding on the streets of Manhattan’s Chinatown than you had when you were a kid. The youngsters who are the focus of Crystal Moselle’s largely improvised, full of street-smarts, and energetic cast have a lot to say to one another, thanks largely to their refusal to spend all their time starting at the small screens that Samsung makes, i-phones that you might swear are designed to sweep away the natural spontaneity of childhood. Director Moselle, whose “The Wolfpack” deals with a group of brothers who are locked away from society in a Lower East Side Manhattan apartment whose pastime is re-enacting scenes from films, again focuses on what for a better term are called “urban”people—generally meaning African-American and Hispanic youths living on mean city streets. 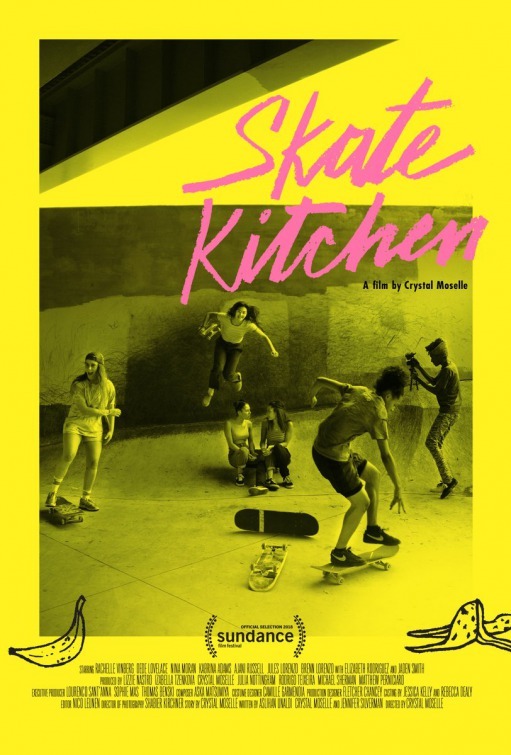 With a screenplay by the director together with Aslihan Unaldi and Jennifer Silverman, “Skate Kitchen” is similar to “The Wolfpack” in that its principal character is also locked away from society at least metaphorically. Eighteen-year-old Camille (Rachelle Vinberg), living with her single mother (Elizabeth Rodriguez), is too distant from the hip streets of New York’s Chinatown. She is still a virgin who has to ask “How do you know when you like a boy?” and “How do you know that a boy likes you?” She had been a tomboy, bonded with her father until the age of eleven when she switched loyalty to her mom as she wanted to learn the joys of womanhood. With her skateboard, she travels to Chinatown, meets members of a group called Skate Kitchen about whom she learned on her i-phone. She is shy and must take her time before she is accepted by an assertive group of skateboarders who admire the risks she takes in the playground—that seems built primarily to allow skateboarders to practice their hobby amid elevations and hurdles. She takes the Long Island Railroad regularly—it’s summer—and soon fits in just fine, whether hitching to the back of a bus, rolling through city streets and never-mind-the-traffic, or enjoying herself in the playground. She becomes interested in Devon (Jaden Smith), a young man who works with her in a supermarket, spends one-on-one time with him, and is ejected from the group for horning in on the boyfriend of Janay (Delia Lovelace). Some of the skateboarding techniques are a joy to watch. Obviously these kids have been on the boards long before the director ever met them. And given their patter, including a professional rendition by one rapper, they are comfortable enough to improvise in front of the camera and to provide the audience with a fly-on-the-wall view of what it’s like to be “urban” in our liberated twenty-first century. As the principal character, Rachelle Vinberg, in her acting debut (this is the director’s non-documentary feature film debut as well), is perfect for the role. Introverted at first as a kid unfortunate enough to be shut away from real life in a suburb, she emerges pretty quickly, coming of age, as they say, when she—and we in the audience—emotionally understand the importance of fitting in, finding your own groove.